Provide comfort for the family of Wayne James with a meaningful gesture of sympathy. ARLINGTON-Wayne James, 84, died Saturday, February 2, 2019 in Arlington. Funeral: 10:00 a.m. Tuesday, February 5, 2019 at Wade Family Funeral Home, 4140 W. Pioneer Parkway, Arlington. Burial will be in Lubbock, Texas. Memorials: In lieu of flowers, memorials may be made to the Wayne James Scholarship Fund in the School of Education at Texas Tech University. Wayne was born September 11, 1934. He was a longtime resident of Arlington where he was in Association Management. A graduate of Texas Tech, Wayne married Peggy Welling in 1971. She survives him. Wayne was preceded in death by his parents, Dalton L. and Minnie Caldwell James. 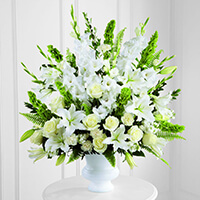 To send flowers in memory of Wayne James, please visit our Heartfelt Sympathies Store. LCR Contractors, LLC sent flowers to the family of Wayne James. Trust in him at all times ,o people pour out your heart before him God is a refuge for us Psalms.62:8.may you find comfort in God's word the bible. Wayne was a good man and friend of many years. I have many great memories of Wayne. He did a lot for Texas Tech . He will be missed. Prayers. It was a pleasure working with Wayne when he served as director of the Texas Lathing and Plastering Contractors Association. We will miss him as a colleague and friend. Our thoughts and prayers are with you, Peggy. LCR Contractors, LLC purchased the The FTD Morning Stars Arrangement for the family of Wayne James.